Facilitated by advanced machinery and contemporary technology, we are offering a qualitative assortment of Embossing Roller. While manufacturing this roller, our qualified professionals use high grade raw material with the aid of sophisticated technology. Besides, the provided roller is stringently examined on different parameters of quality in tune with set industry norms. 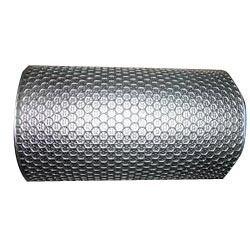 This roller is made available at an economical price within stipulated time frame. Note : This is the approx. Price .Price may vary in case of customization of product. “Print Pack Stereo” is a well-known entity established in the year 1996, at Vadodara (Gujarat, India) engaged in manufacturing and supplying a high quality range of Rotogravure Cylinder, Flexo Nylon Plate, Industrial Roller, Pharma Rubber Stereo and Online Rotogravure Printing Machine. Our offered products are widely acclaimed in These products are precisely designed and manufactured using the finest quality factor inputs and advanced machines & equipment to manufacture these products in accordance with the predefined quality standards. Also, the offered products are extremely valued by the esteemed clients for their optimum strength, dimensional stability, precise carving, rust free nature and perfect finish. These products are also available in various dimensions and specifications as per the varied requirements of our clients. Besides, we also render high reliable and precise Etching Service for a variety of metals. This service is render by our skilled professionals in a precise way as per the details laid down by our clients. Apart from this, we also provide Metal Etching Services to our clients.